Part of what makes Your Employment Solutions different from other Utah staffing companies is the quality of our people. We know the best companies in the world attract the best people, and there's no exception in the business of Utah jobs. One example of that is our October employee spotlight, Brigham Yates. Brigham has been the YES go-to guy in a lot of categories for many years. He's calm, cool, thoughtful, and an all-around great person to work with. He's also a champion soccer player, outdoor enthusiast, and a recently new father. If I had to pick 4 other things besides soccer they would be. Snowboarding, Biking (Road, Mountain), Rock Climbing, Tennis. Stepping on melted ice in the kitchen with socks on (obviously not on purpose). An exercise room and shower. 7. If you were a superhero, who would you want to be? Batgirl? The Bionic Woman? Or Wonder Woman? And why? Batgirl. Reason is simple. She gets to wear stretchy pants. Getting an employer to see what YES can do for them. That it's a amazing place to be with amazing people. 11. Who do you look up to the most? Reed or Kerry? Oh wait, they’re both taller than you – so you must look up to them both, right? Funny… I look up to both Reed and Kerry and for different reasons. Here is just one example. Reed is such a go-get-it type of personality. Which is great in many ways because he gets things done. Kerry's style on the other hand is a little more patient and laid-back and so the two of them strongly complement each other in terms of leadership. Thank you Brigham for being such a good sport, and for all you do to help us all work better! 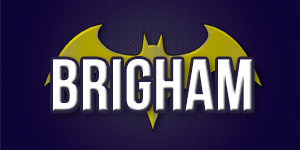 Way to go Brigham, keep up the good work!